Aerosmith fans, listen up—if you’ve ever wanted to play the drums alongside Aerosmith drummer Joey Kramer, now you can! 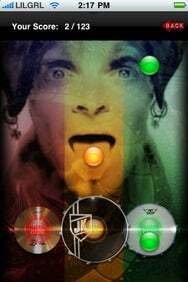 Paid Inc's Joey Kramer Hit Hard plays like a drum version of Tap Tap Revenge, and features 15 levels of beats recorded by Joey himself. Contrary to rumors, this dude does not, in fact, look like a lady. There are five levels, each with three different difficulty settings for a total of 15 levels. The game is played like Tap Tap Revenge—there are three drums at the bottom of the screen, and you must tap them in sync with the beats. Unlike Tap Tap Revenge and other Guitar Hero-esque games, it doesn’t matter how accurate you are—you either get the beat or you don’t (there is no “good” or “perfect” or “ok” level of tappage). There is also a “Freestyle” mode, which would be cool…if it worked. The Freestyle mode features a full tappable drum set, but none of the drums make any sound (I tried this on both an iPhone 3G and an iPhone 3GS). While the idea of a musical drum game for the iPhone is a cool one, Joey Kramer Hit Hard was a bit of a disappointment. First of all, tapping the drums at the right point elicits no audible feedback (unlike what happens in other musical instrument games). If you sit back and don’t tap the drums at all during the game, the soundtrack doesn’t change one bit. This is disappointing because you can’t really get into the rhythm of the piece. Another issue I had was with the size of the tap area—it was simply too small. I found it was nearly impossible to tap accurately, and that I often had to tap a little above the area (which conveniently says “tap here”) for my taps to register. All that said—the game is worth getting if you’re an Aerosmith fan. Why? Because at the end of each month, the player with the highest score on the leaderboard (you can submit your score once you’ve completed all 15 levels) will win a Joey Kramer-related prize—including autographed crash symbols and snare drums.